Gene Lantz is a Texas based activist. He is married to Elaine Lantz. Gene Lantz has been a union man for most of his working career. He retired from Vought Corp. in 2002 after working there for 27 years. He is the chairman of the United Auto Workers Union Local 848 that represents the plant. Prior to that he worked at Dresser where he joined his first union, the United Steelworkers of America. There he walked out during a strike in 1978 and joined his first picket line. The union bug was instilled in Lantz by his father. Lantz was born in Oklahoma and his father worked in the oil fields in Texas and Oklahoma. Lantz first job was in the oil fields near Pampa. In the 1970s Gene Lantz was a member of the Socialist Workers Party. he formed a group within the party called the Tendency for Party Growth, which eventually split from the SWP. Within days after the SWP's 1981 convention, members of the Tendency for Party Growth—split from the party. This grouping had opposed the party's turn to industry on the grounds that it is based on an exaggerated view of the radicalization in the working class. They proposed as an alternative orienting toward radical petty-bourgeois layers, along the lines that supporters of Jack Lieberman had done at the 1979 convention. Their views were thoroughly aired in the preconvention discussion, and decisively repudiated by the convention. Their response was to quit the party immediately following the convention (as the Lieberman grouping had done two years before). [T]he SWP leadership has chosen to avoid discussion with its rank and file members about its major political orientation for the past 3 1/2 years. During this period many of the comrades most able to lead the rank and file against this erroneous course have left the SWP in a thin but steady trickle, while the most subservient and unquestioning have ascended into leadership. The North Star Network was led by Byron Ackerman, Peter Camejo, and Gene Lantz. Gene Lantz joined the Communist Party USA in the early 2000s. Though he also may have been involved in the Party before he joined the Socialist Workers Party. In September 2006 the Peoples Weekly World listed several members and supporters of the Texas Communist Party USA. Andrea Greimel, Andy Sivak, Brad J, Celia Joanna Stanford, Elaine Lantz, Gene Lantz, Francisco Paco Cantu, Frank Valdez , Sheila Valdez, Hernando Martinez, Jaime Martinez, John Stanford, Paul Hill, Richard Pressman, Stewart Minor. 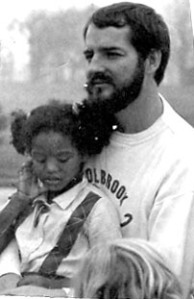 In 2006 Gene Lantz wrote an article for the Communist Party USA's People's World, entitled "Oklahoma dreams and nightmares, The Innocent Man: Murder and Injustice in a Small Town". Gene Lantz supported the candidacy of Barack Obama in 2008. 2009 Mother's Day Greetings and Love to the multi-talented Joanna Stanford — now in hospice care — whose life has combined love of family with distribution of the People's Weekly World and predecessor papers, and with the struggle for a world of peace, justice, freedom, art, dance, dolls and handicrafts. Signatories included Gene Lantz and Elaine Lantz. In 2009 Gene Lantz was North Texas contact for Jobs with Justice. In 2011, the Texas delegation to the national Jobs with Justice conference included Gerardo Contreras, Jim Rivers, Brad Walker, and Gene Lantz. They made the trip to DC Aug 5-7 for the powerful education and inspiration offered. When 500 retirees convened in Washington DC, Setember 2011, for the Alliance for Retired Americans legislative conference, nine Texans were among them. Tony Padilla and Emmett Sheppard came from Central Texas; Melva White, Emma Stewart and Eunice Parrish came from Houston; and North Texas contributed Sarah Carothers, Bob Felzke, Mary Felzke, and Gene Lantz. Seven of the Texans were able to participate in an afternoon of visiting Congresspeople on Capitol Hill on September 8th. Tony Padilla's vast experience in these visits was best utilized by letting him go on his own, but six others were led by Emmett Sheppard through several offices. They visited Congressman Jeb Hensarling, Congressman Kenny Marchant, Congresswoman Eddie Bernice Johnson, Congressman Lamar Smith, and Congressman Al Green. Mr Green, a longtime friend of Sheppard, "was especially hospitable". At noon on November 13, 2009, activists from MoveOn, Organizing for America, Jobs with Justice, (including local leader Gene Lantz), and the Progressive Center of Texas poured into the offices of Congresswoman Eddie Bernice Johnson. They were there to express their gratitude for her vote on the House version of national health care reform. They were greeted by District Director Rod Givens, who told them that, "it is folks like you who keep the Congresswoman propped up! "The group brought a giant "thank you" card that each of them had signed. They also brought bouquets of yellow roses. What might be more important in the long run was a stack of signed cards pledging future support for the Congresswoman. Many of them carried pledges to work several hours in her next campaign. Texas had one of the largest delegations, after the gigantic Florida group, in Orlando for the Southern Regional Conference of the Alliance for Retired Americans in May 2012. They were Emmett Sheppard, Marty Alvarado, Carol Yontz, Gene Lantz, Linda Chavez-Thompson, Judy Bryant, Jim Rivers, Maggie Kramer, Ray Kramer. In 2013 Jim Rivers and Gene Lantz attended the May Alliance for Retired Americans conference. Tony Padilla, Secretary for the Texas Alliance of Retired Americans in Dallas, Texas May 3, 2013, greeted guests at a Fiesta Dinner to Honor Congresswoman Eddie Bernice Johnson. "Greetings and Good evening Brothers and Sisters, President Gene Lantz, Officers of Board of the TARA, Vice President Emeritus of the National AFL-CIO Linda Chavez Thompson, Congresswoman Eddie Bernice Johnson, Congressman Marc Veasey, Officers of the National Board of ARA, Members and Distinguished Guests. Today is a very special night as we honor congresswoman Eddie Bernice Johnson, and it is a historical night for seniors. Congressman Marc Veasey, we also want to say thank you for the support you give to seniors and the Machinist union on issues before congress, and for your contribution to honoring Congresswoman Eddie Bernice Johnson on this very special historical night. Gene Lantz, is affiliated with the Progressive Center of Texas. 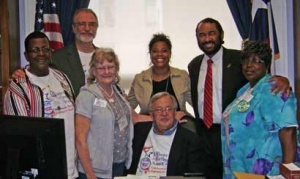 Congressman Marc Veasey claims to be a friend of Texas Communist Party USA member Gene Lantz. Gene Lantz, Elaine Lantz, and Leah Witherspoon visited Feb 20, 2013, at Congressman Marc Veasey's Dallas office, representing the Texas Alliance of Retired Americans. The Texas Alliance for Retired Americans continues its blistering trail of actions on behalf of retiree rights. This morning, February 20, we visited the new congressman of the new District 33, Marc Veasey. Leah Witherspoon, Elaine Lantz, and I thankedd the Congressman for his work so far. We checked to make sure that he will be listening to veteran Congresswoman Eddie Bernice Johnson. The two are close friends, and we were very pleased to receive his assurance that he values her positions on seniors' issues as much as we do. The first topic was the "sequester" cuts that are supposed to hit the federal budget on March 1. Unlike most of his colleagues, this Freshman Congressman bears none of the blame for having put us in the situation of seeing dramatic cuts that might set out economy back just when we need more thrust forward. Congressman Veasey, like all of us, is worried that the cuts may actually happen this time. They were originally scheduled for January 1, but they "kicked the can down the road" to March 1. The actual agreement came about in Summer of 2011, but all those who negotiated it and voted for it then are denying it now. We also talked about some of the more confusing legislation that is being presented. We told the Congressman that we are against means testing and extending the age to qualify for Medicare, even if President Obama hinted in his State of the Union Address that he might negotiate on them. We also explained the intricacies of the "Chained CPI" issue that is really just a cut in Social Security retirement benefits despite its bewildering explanation. Congressman Veasey is terrific for seniors. Democratic Precinct Chair Elaine Lantz, and her husband Gene Lantz, both involved with the Communist Party USA, endorsed Marc Veasey in his 2012 run for Congress. When 500 retirees convened in Washington DC, Setember 2011, for the Alliance for Retired Americans legislative conference, nine Texans were among them. Tony Padilla and Emmett Sheppard came from Central Texas; Melva White, Emma Stewart and Eunice Parrish came from Houston; and North Texas contributed Sarah Carothers, Bob Felzke, Mary Felzke, and Communist Party USA member Gene Lantz. In July, 2013 Walmart, sued Gene Lantz, a retired Texas union activist, the United Food and Commercial Workers, OURWalmart, and Jobs with Justice for civil trespassing for crossing their parking lots. Gene Lantz has been making videos of public officials supporting Walmart workers and posting on them YouTube. He believes this may be a key tactic in the long strategy to hold Walmart accountable. In 2014 Gene Lantz was President of the Texas Alliance for Retired Americans. In July 2014 Gene Lantz, President of the Texas Alliance for Retired Americans, and his colleague Jim Rivers represented the Labor/Texas Alliance Caucus at the Texas Democratic Convention. Gene Lantz attended the Texas Democratic Party convention in Ft Worth on June 22 2018. Gene Lantz Phonebanking for Terry Meza, October 2016. Elaine Lantz, Gene Lantz with State Rep. Robert Alonzo, Rena Honea. This page was last modified on 13 January 2019, at 22:47.